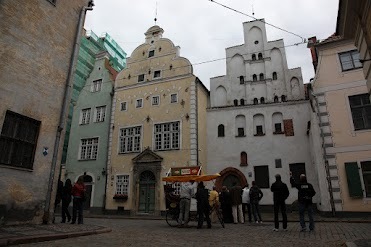 The tradition that members of one handicraft live on one street was in full force and effect in medieval Riga, too. So we can find three dwelling-houses surviving from the former Backer Street side by side to each other, perhaps this is the reason why these houses are called Three Brothers. The oldest brother was built at the end of the 15th century, it is the only premise that survived originally from that time, the next house is dated from 1646, but the last building is from the end of the 17th century. With the pediments facing the street these houses present the main principles of medieval building manner. Reconstruction carried out by P.Saulitis and G.Jansons. Museum of Architecture is settled in 2 of these buildings.